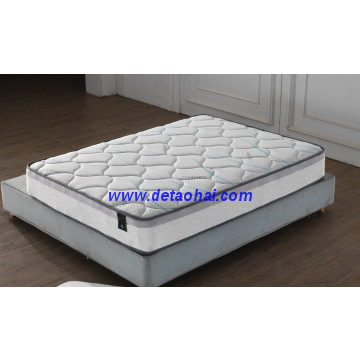 ModelDT-RP24 CapableISO9001,CFR1633 Min.Order250 Brand NameDetaohai Brief DescriptionHigh quality pocket spring mattress with convoluted foam pillow top,silent independent pocket spring is made of high-carbon steel wire. The support you need, where you need it. The 3 zone system makes sleeping good but waking even better. High carbon spring steel wire and high quality non-woven. Heat treatment and anti-rust treatment to springs. Conform to the natural corve of the human body. Excellent materials , ventilation is not hot, long service life. Reduce unnecessary for infant sleep, reduce snoring, muscle pain,etc. Does not blog blood circutation. Anti bacteria resistant mites. 3. 2.5cm 28# density foam. 1.All the mattress can be vacuum compressed with PVC bag in a wooden pallet. 2.Rolled in a box . 3.Normal packing , well packed with water proof plastice bag and paper kraft. Inside package: water proof PVC bag and conner protector. Outside Package: thick paper kraft , outside package. Mattress vacuum compress and packed in a pallet. Q1:Are you a factory? and where is your factory? A1:Yes,we are a factory, and our factory add is Longjiang town,Shunde District,FoShan city,GuangDong province,China528203. A2: One container price is much cheaper. Q3: What is the price? A3:Price is according to the quantity and size, so kindly let me know your order quantity and size(width&length&height). Q4: How long will you delivery the goods in busy season? A4: according to your total quantity and usually within one month. Q5: How to package the mattress? A5: Compress then roll up in a carton, save space , convenient and retail. Compress with pvc bag , then fixed by the wooden pallet. Well packed with paper kraft. Q7: Can accept what kind of trade terms? A7: EX-Work , FOB, CIF. Q8: Where is the loading port? A8: Our factory is in Guangdong , so usually the loading port is in Shenzhen, Guangzhou. Q9: Can you send me the samples? A9: Yes, we can. But you need tell us your size and material. Sample is not free, but will refund back after your seconder. Q10: Why choose us ? 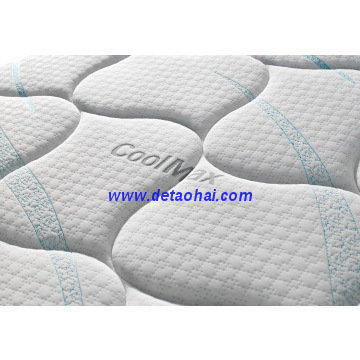 A10: Good material and skillful workers to make our mattress with good quality and elegant looking. Strict manufacturing and quality control management system to ensure our mattress meet the standard of all of you from home and abroad. 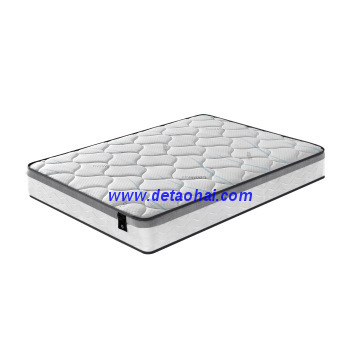 Mattress can be made according to your requirements . OEM available. FOSHAN CITY DETAOHAI FURNITURE CO.,LTD. Foshan City Detaohai Furniture Co., Ltd was established in 2003,located in China's Town of Furniture, Foshan City, Guangdong, China.It was originally a spring factory and called the “Spring Expert” locally. Over the last ten years, the company has expanded its facility to over 12,000 square meters and currently consists of a mattress factory, a spring factory and a furniture material company. 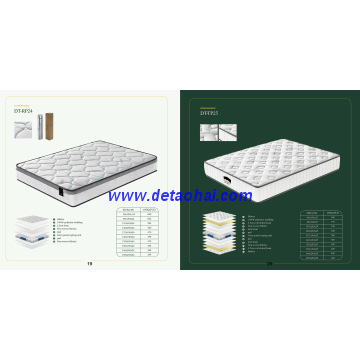 As an experienced mattress and spring manufacturer, Detaohai exports its products to Europe, America, Australia, Asia, Africa and more than 40 countries and districts.It has brands as “detaohai”,"Mengxi", "Yumengxi", haizhiyun", etc. The production series are: CFR 1633 standard series for US marker; BS 7177 standard series for UK market, Hotel series, Rolled series, Knock-Down series, etc. The products passed the burning tests for CFR 1633 and BS 7177.,ISO9002,SGS. The company affords to the consumers from different countries and districts with different sleeping customs for good and healthy sleeping. Besides meeting our production demand, our furniture materials are supplied to other local furniture factories and also exported to Japan, Malaysia, Australia and India, etc. In summary, our goal at Detaohai is to become one of the largest Chinese OEM mattress manufacturer and furniture material supplier. Our business model is “Mutual Benefit, share to get”. Namely, we gain base on all our customers profit. No.3,XinLong Road ,Longjiang Town ,Shunde Area,Foshan City,Guangdong Province,China. Detaohai Hardware Spring Factory is an excellent enterprise specializing in the production, research and development of Sofa Pocketed Spring, Mattress Pocketed Spring, Coil Spring and Zigzag Spring. Advanced in technology and committed to quality, our company strictly complies with the IS09001 quality system standards. Adhering to the scrupulous management principle of "seeking for perfection", we strive to advance with the times and become a professional enterprise. Our products, selling well all over China and many countries in Europe, America, and Southeast Asia, etc., we have won the praise and trust of many customers.